Your little one’s imagination will be the limit when playing with this glorious Boxset Beach Villa. 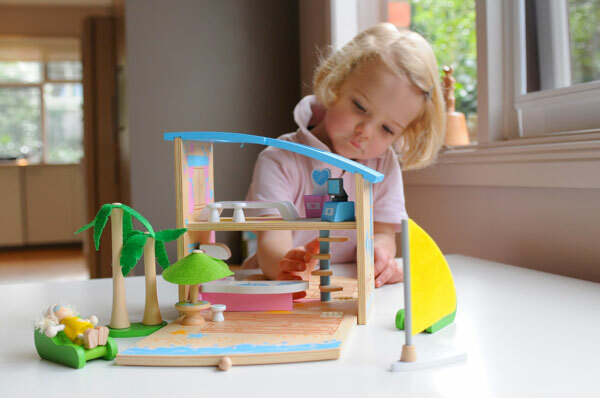 The neat and compact wooden box opens up to reveal a colourful seaside home and contains all the furniture and people that are required to complete the scene – including palm trees and a windsurfer! Invest in this holiday real estate for $59.95 from Quirky Kids Online. Understanding that bodies are constantly growing is a hard concept for children to grasp but they love to see the progress they’ve made over time. 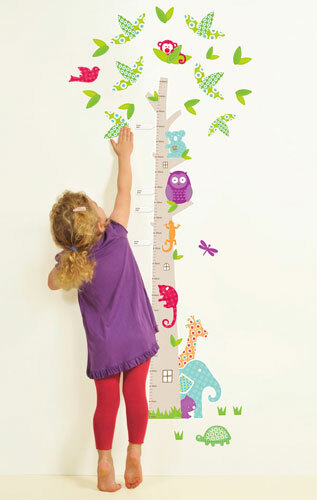 The charming Height Tree Moveables is perfect for keeping track, not only does it have charming animals and critters perched in it, it also includes name and date stickers and measures right up to 150 centimetres. You can stick this removable wall decal up wherever you like and it won’t damage the wall surface at all – that’s the beauty of Moveables! Height Tree Moveables is priced at $79.95 and available from Little Chipipi. Summer is all about outside fun and why not let the littlies make the most of it with the Crazy Forts kit? Hours will be spent building and playing in their construction and it will come in handy too during the cooler weather for indoor play! The kit contains forty-four sticks and twenty-five geometrically precise balls for endless building possibilities. Available from Where Did You Get That?, who are running a Christmas special of two Crazy Forts kits plus a set of Crazy Fort Lights for the one price of $239.95 (delivery extra). That’s twice the fun! 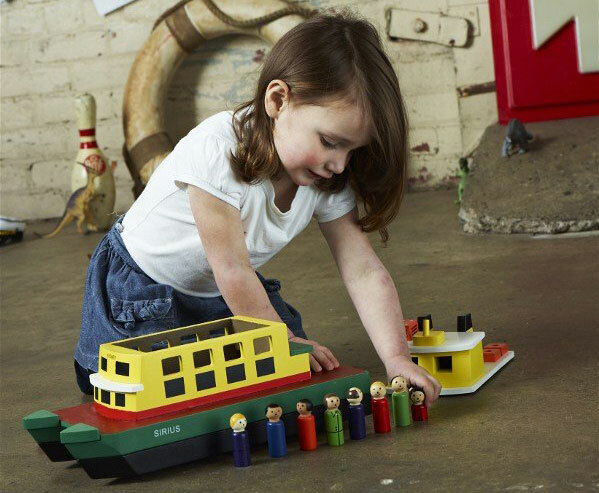 Sydney residents and boating enthusiasts will adore the Make Me Iconic Wooden Sydney Ferry play set. Painted in authentic colours, the ferry comes complete with a crew of two sailors and eight passengers that are happy to embark and disembark as many times as your preschooler sees fit. The top deck comes off for access to passengers and wheels on the bottom of the ferry make for easy pretend sailing. Priced at $95 and available from Monkey Caboose. If fast cars are more your child’s speed then we highly recommend the Automoblox series. These awesome wooden cars can be pulled apart and parts interchanged with other cars in the series to create new and even more interesting models – ever wonder what a people-mover crossed with a ute might look like? Indulge your mini rev-head with these modern classics, priced from $54.95 and available from Rudy and The Dodo. If it’s a multi-purpose gift you’re looking for then consider the I’m Toy 7 in 1 Activity Centre. 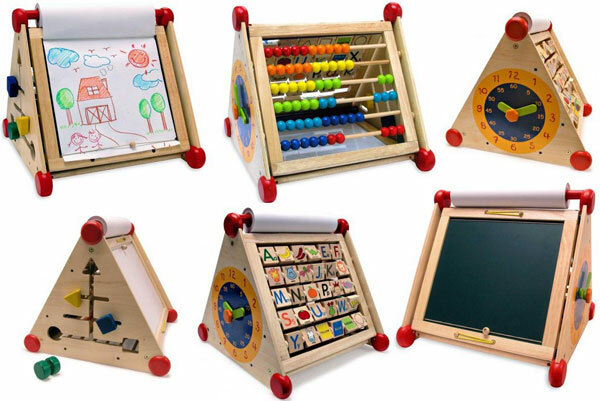 This one clever toy will see your child count on the abacus, draw on a chalkboard or paper roll, learn the alphabet, play with time on the clock, move and sort shapes and find things to stick to the magnetic board. It’s both educational and fun, kids will have a blast skipping from one activity to the other. Make it yours for $115.95 from Eco Toys. Have some good old fashioned music band action with The Grateful Thread Rock Star Soft Guitar. The family and friend crowd is sure to go crazy when this guitar is whipped out on stage for some Christmas carol action. 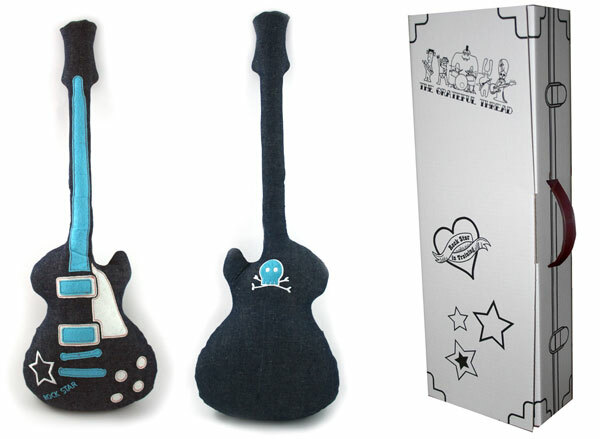 Made from felt, cotton, denim and stuffed with polyfill, this silent guitar will be music to your ears as budding rock stars perfect their stage persona! The Rock Star guitar is presented in a gorgeous cardboard guitar case, available from A Little Bit Of Cheek for $49.95. Pair it with the Jimi tee and your preschooler really will be rocking around the Christmas tree. 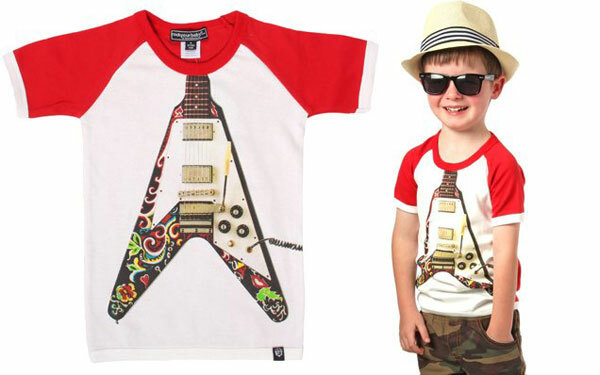 Budding musicians will love doning this cotton tee with its coolest of cool guitar print, bold red sleeves and a slogan on the back that reads (or warns!) Rock and roll, It might get loud. Priced at $29.95, rock on over to Baby’s Got Style to add this gem to your child’s wardrobe. Salad has never been so much fun! Start teaching about food and healthy eating with the Healthy Gourmet Salad from Educo. Little would-be apprentice chefs will love adding all the gorgeous wooden salad ingredients in the bowl followed by a dash of vinegar, oil and a quick pepper seasoning before tossing them together! 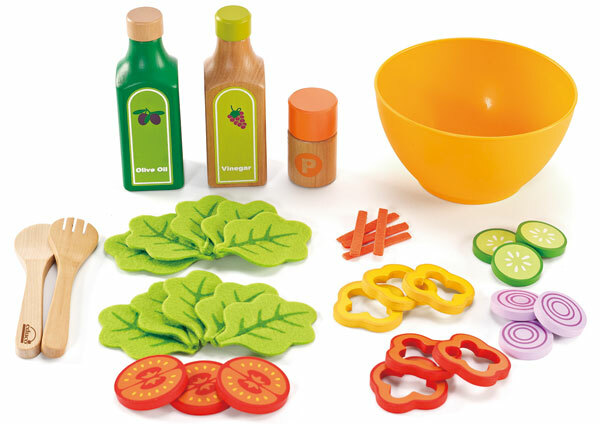 This yummy salad set is available for $39.30 from Classic Baby. Next time you say just five more minutes your child will know exactly what that looks like with the Plan Toys Activity Clock. Your child can learn about the time of day by matching the everyday activity cards to the appropriate time. 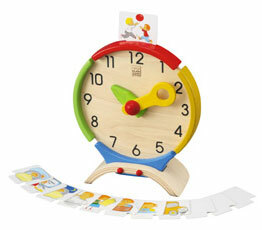 Plan Toys Activity Clock is available for $54.96 from Sustainababy. Little ladies will adore jewellery that is made especially for their size. 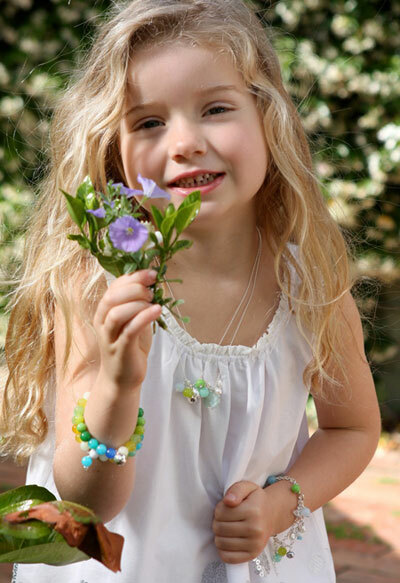 Alouette Petite Jewellery is a collection full of children’s bracelets, necklaces, bangles and even keepsake jewellery. The use of coloured semi-precious stones, pearls and sterling silver mean these accessories are far too pretty to be kept in a jewellery box! Prices start from $25 at Alouette Design. For those heading to kindy and school why not give them a gift to enjoy Monday to Friday? A packed lunch has never been cuter with the help of these cheeky Kawaii For You Insulated Lunch Bags. A carry handle and Velcro closure mean these lunch bags are super easy for kids to open and keep contents cool with an insulated lining. 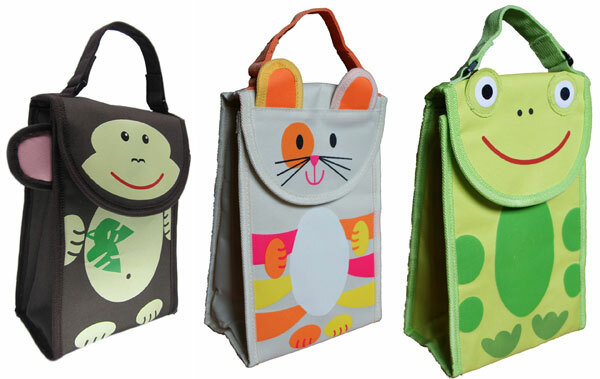 These great lunch-time companions are available in a monkey, frog or cat design and priced at $24.95 from Cheese and Pickles. We wish you luck in finding just the right gift for your preschooler while they busily start counting down the sleeps until the big day! Make sure you check out our gift guides for other age groups and categories – it’s gift-selecting made easy!